"The Steve arc appeared for only about 20 minutes, starting at 10:45 pm MDT, during a lull in the main display," says Dyer, who captured the arc in a 6-shot, 360o panorama. For many years, northern sky watchers have reported this luminous form occasionally dancing among regular auroras. It was widely called a "proton arc" until researchers pointed out that protons probably had nothing to do with it. So members of the Alberta Aurora Chasers group gave it a new name: "Steve." "We seem to be ideally located in the Canadian Prairies for sighting Steve, as we often get the main aurora to our north, placing Steve overhead or to our south," notes Dyer. No one fully understands the underlying physics of the purple ribbon. One of the European Space Agency's Swarm satellites flew straight through Steve during a previous apparition. Data revealed a relatively hot river of gas, about 25 km wide, flowing rapidly through Earth's outer atmosphere. "Steve seems to be a thermal emission from hot flowing gas rather than from precipitating electrons," says Dyer, "but his origin and nature are still mysterious." Not so. "Steve" is a Birkeland current and has been understood for at least 100 years. For the life of me, I don't see what's so hard to understand about this. Thank you Maol for posting the image of "Steve". In the original post the second link shows an artist's impression of what a Carrington Event might look like when it hit Mars. I really need to work on my internet skills. Interesting, this description of Mars' magnetic fields and interaction with the SW. This same combination of ions from the wind and the planetary body is likely happening with other solar system objects, comets and asteroids. 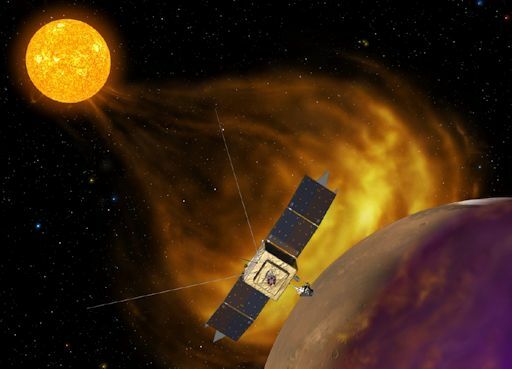 Mars has an invisible magnetic "tail" that is twisted by interaction with the solar wind, according to new research using data from NASA's MAVEN spacecraft. The team found that a process called "magnetic reconnection" must have a big role in creating the Martian magnetotail because, if reconnection were occurring, it would put the twist in the tail. "Our model predicted that magnetic reconnection will cause the Martian magnetotail to twist 45 degrees from what's expected based on the direction of the magnetic field carried by the solar wind," said DiBraccio. "When we compared those predictions to MAVEN data on the directions of the Martian and solar wind magnetic fields, they were in very good agreement." The magnetic reconnection process also might propel some of Mars' atmosphere into space. Mars' upper atmosphere has electrically charged particles (ions). Ions respond to electric and magnetic forces and flow along magnetic field lines. Since the Martian magnetotail is formed by linking surface magnetic fields to solar wind fields, ions in the Martian upper atmosphere have a pathway to space if they flow down the magnetotail. Like a stretched rubber band suddenly snapping to a new shape, magnetic reconnection also releases energy, which could actively propel ions in the Martian atmosphere down the magnetotail into space. I think it has been discussed in here before, that cometary bodies' comas are formed in part by the SW magnetic field stripping ions from the body. Heard this rumor that Mars was actually a moon and not a planet. maybe I misinterpreted some other planet. Re: Was Mars a Moon? All planets could be considered moons. As in where do they come from if not from larger more energetic bodies? If I had to speculate I'd say Mars could have been picked up by the Saturnian planets elliptical orbit into our Solar System at any point over the last 2-3Million years. But I can't find any reliable artistic depictions of Mars being included until 40,000BC The legs are formed by a stream of plasma to Mars, but the feet are never shown. The plasma stream to Mars may have been bifurcated, which would make the dual streams look like legs. Mars had no magnetic field so its coma would be dramatically smaller then the rest of the gang above.